Prime Minister Naoto Kan met with Mr. Rafael Vicente Correa Delgado, Constitutional President of the Republic of Ecuador, who is on a working visit to Japan, on September 6 (Mon) from 12:00 to 12:30 p.m. at the Prime Minister's Office. Following that, the two had lunch together until 1:20 p.m. The overview of the meeting is as follows. (1) At the start of the meeting, Prime Minister Kan welcomed President Correa, who is visiting Japan for the first time, and expressed his expectation that the visit would encourage the further development of the bilateral relationship between the two countries. 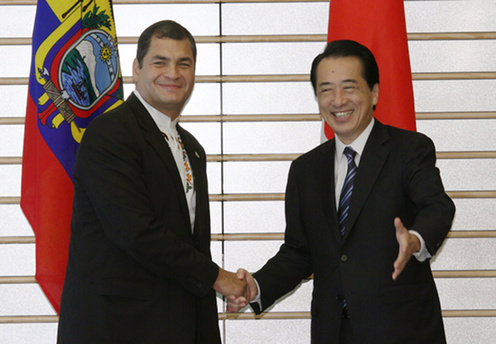 President Correa responded that Ecuador values highly its relationship with Japan, and that he had brought many members of his cabinet with him to Japan in the hope of using the visit as an opportunity to encourage trade and strengthen the cooperative relationship of the two countries. He also noted that Japan and Ecuador share many common beliefs on a wide range of issues, including the realization of a world without nuclear weapons and the reform of the United Nations. 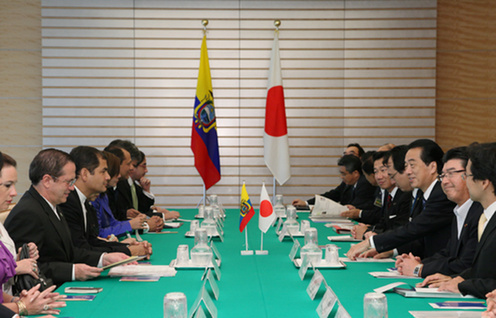 (2) Prime Minister Kan expressed his hope that Japanese companies would develop a greater interest in Ecuador through an investment seminar and business negotiation event to be hosted by Ecuador during the visit. He also requested that Ecuador work to develop a stable investment environment. In response, President Correa stated that the interests of foreign companies would be protected appropriately under a new legal system based on Ecuador’s new Constitution, emphasizing the country’s political stability under his administration. (3) President Correa conveyed his support for the election of Japan as a permanent member of the United Nations Security Council, to which Prime Minister Kan expressed his gratitude. (1) Prime Minister Kan stated that, leading up to the tenth meeting of the Conference of the Parties to the Convention on Biological Diversity (COP 10) to be held in Nagoya, Aichi Prefecture in October 2010, he hoped to cooperate more closely with Ecuador, a country which contains many areas featuring diverse ecosystems, such as the Galapagos Islands and the Amazon Rain Forest. In response, President Correa noted that the constitution of Ecuador includes a clause establishing that every citizen of Ecuador will be able to accuse any person or community that would commit destruction of nature, and explained that it is the “greenest” constitution in the world. He also expressed his hope to cooperate for the success of COP10. (2) The main topic discussed at lunch was environmental issues. In addition to the above, Ms. María Fernanda Espinosa, Minister of Coordination for Cultural and Natural Heritage explained Ecuador’s global warming countermeasures, efforts for the protection of biodiversity, and nature conservation projects taking place in the Amazon aimed at protecting native people.